The worthy outright winner of this year's Ricci Foundation award was Mikhail Shilyaev from the RNCM in Manchester, a stylish and thoughtful pianist who presented a well balanced contrasting programme entirely by memory. His Haydn was well turned and ornamented, its improvisatory waywardness bringing to mind the fantasies of CPE Bach, and making me think that it would go well on the clavichord. I hope that when he is next at the Royal Academy he may want to explore their York Gate collection of Early Keyboard Instruments. Schoenberg's Op 33 was brought to us lucidly, displaying Shilyaev's interest and sympathy for contemporary repertoire, not evident from the other finalists. He encompassed the virtuosity and extreme emotions of the Scriabin sonata with ease and conviction, albeit with a restrained manner at the keyboard. 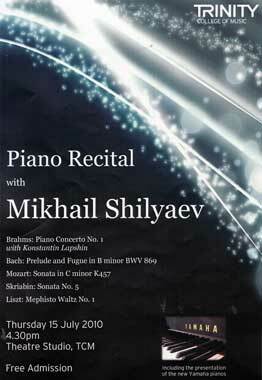 I look forward to an early opportunity to hear Mikhail Shilyaev in a full recital; perhaps he'll apply for the PLGYA? Of several short-listed runners up I heard, Yevgeniy Kostrytskyy (violin) impressed in an exciting and flamboyant account of Waxman's Carmen Fantasy, and a special word of commendation is due to his pianist partner Sasha Grynyuk. Midori Sugiyama (violin) gave compelling unaccompanied performances of Bach's Sonata No.2 and, especially, Ysaye's Ballade Sonata for solo violin. But Tchaikovsky's Waltz-scherzo was perhaps an unwise choice for her; although played with commitment, its sustained interest was insufficient to show this well equipped violinist at her best. Both are names to watch. Mikhail Shilyaev acquitted himself with distinction in an essential rite of passage for aspiring concert pianists. He is one of those who convey an inward quality, never indulging in audience-pleasing posturing. Economical movements, good posture; a diffident little bow belying confidence and authority at the keyboard (reminding me of Marc-André Hamelin, whose face whilst playing is inexpressive; his new Hyperion DVD is my piano recording of the month). This was a good Emperor without frills or special point-making to establish the pianist's identity. Shilyaev let you know from the first flourish that he knows where he's going and takes you with him; no fears that memory or technique would let him down - he rarely glances at the keyboard. He sensed the acoustics of St John's and it sounded well from the back (where the sound for piano is best). I enjoyed it there in close proximity to the illustrious Peter Feuchtwanger, famous exponent of "Functional and Natural Approach to Piano Playing", who enjoyed it as I did. The orchestra was the excellent free-lance professional band London Soloists who played with assurance under their conductor David Josefowitz (the Ricci Foundation competition which Shilyaev won had been held in the eponymous concert hall at RAM). There was easy rapport which made for a sound exposition of the concerto from all involved; this account of the concerto lacking the tension between soloist and conductor which can make for listening frisson, but none the worse for that. 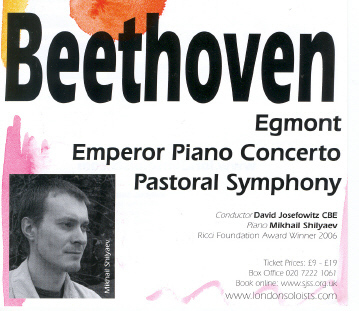 An auspicious concertoappearance for a British-based pianist whose progress will continue to merit attention. Commercial CDs will surely be not far behind? This impressive and well recorded compilation of live recital performances in Europe has been received from Mikhail Shilyaev on CD and it supports my positive response (and the Jury's) to his competition programme. Shilyaev's inclusion of such as Ohana and Eben alongside standard repertoire bodes well for the future of one of the more interesting young pianists currently based in UK. 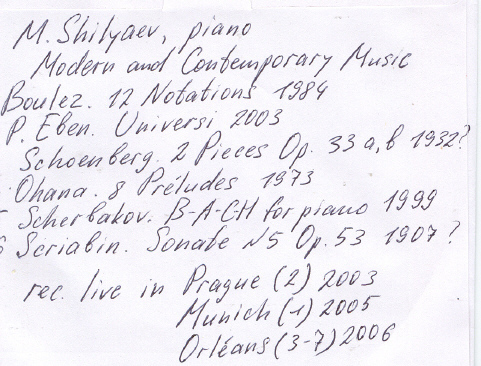 Mikhail Shilyaev gave this demanding recital in preparation for entering international piano competitions. He had recently impressed in Bartok's Concerto No 3, and brought a similar poise and confidence to the Brahms No 1. Knowing the Brahms Op 34 in its two piano version, it was interesting to hear the two piano reduction of the concerto; I suppose it would have been heard in that way before its orchestral premiere? It went very well, with good rapport between Shilyaev and his partner Konstantin Lapshin, who had a far from easy job and deserved more prominent billing. Their performance should be repeated in a more suitable hall. The Theatre Studio, which proudly houses two brand new Yamaha Grands, is far too small, and Liszt and Skriabin were overwhelming there. If it is going to be used regularly for public performances, the College should be prevailed upon - even in these cash-strapped times - to do some acoustic treatment of the hard reflective walls and ceiling, with sound absorbing curtains along the west window wall (as in RAM's David Josefowitz Recital Hall where Shilyaev won the Ricci competition - see above). These would help too for teaching events, as otherwise students may become inured to excessive volume and begin to take it for granted. The Bach sounded fine from outside the door, but Mozart's great sonata was over-virtuosic (in a Russian style ?). For that repertoire it would be good to have Trinity's excellent fortepiano * available for the Peacock Room and Theatre Studio next door, alongside the Yamahas, to encourage many more of the piano department's students to work with it in the earlier repertoire. * - - a superlative copy by Johannes-Secker of a Stein fortepiano, which is to stay at the College. Trinity's good fortune was demonstrated by Carole Cerasi - - and left you not wanting to hear a Steinway in such repertoire for a long time. I attended that concert, together with a large regular audience. Walking to SJSS from Westminster, past our ever more heavily barricaded Parliament, is like traversing a war zone ! It was very much a 'competition-violinist' occasion and Eric Wang has a few technical problems still to be addressed. Repertoire is vital in developing a career. The nod towards Mozart (Sarasate's Magic Flute Concert Fantasy) was topical and enjoyable, but a dull set of virtuoso variations by Wieniawski too in the same short programme was a mistake.Fauré's No 1 Sonata was powerfully led from the piano by Evelyn Chang, who is heavily involved with contemporary music and well remembered from her successful PLGYA debut. There was however a lack of Gallic charm, or indeed Taiwanese wit (?) 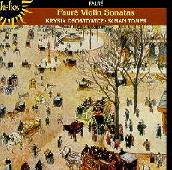 in the hour, which sent me back to my treasured Hyperion CD of both Fauré sonatas. Inside the jewel case I found my review from who knows what paper journal! Evelyn Chang's commanding way with the scherzo was impressive, but lacked the delicacy of the young Susan Tomes with Krysia Osostowicz [Hyperion CDA 66277, 1987]. Hopefully Wang will throw away his competition war-horses now and maybe they'll explore the second Fauré sonata for a future joint appearance?